LP loves to look 'cool', he likes unique t-shirts or sweaters and has his own style. He'll often come downstairs in an outfit and ask me if he looks cool or not. 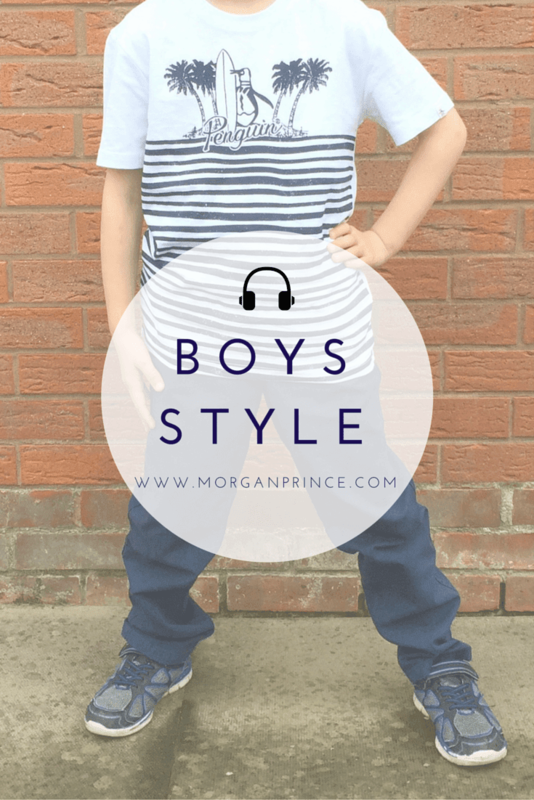 He's learning what he likes and what he doesn't and deciding whether it's good enough to wear. With that in mind I asked him to sit down with me and pick out a few outfits that he thinks would look good together. Okay so I've learned that LP has expensive taste (much like me! ), but I have to admit that this outfit would look cool. He loved the Kenzo t-shirt because of the tiger, and the high-tops for the eagle. As he said, he'd look pretty awesome in this! There are those trainers again! And that tiger, although this one I guess is for when it's a bit colder. At least he chose some cheaper jeans this time! I imagine LP wearing this outfit for a school party or something. I'm getting the feeling he wants those trainers. LP has a thing for shirts at the moment, be it long sleeved or short, he loves them. He thinks they look smart and has even started asking for ties to wear. I think this outfit would be great for an evening meal in a restaurant or a family wedding. I particularly like the Disney touches on the shirt, if you can't tell they're little marvel figures, eg Spiderman's head, Thor's hammer. Even though LP likes to look smart, or cool, he still likes his lazy days. As soon as he saw the sweatpants he pointed at them, and after reading 'fleece' on the Timberland sweatshirt he pointed at that too. He likes the soft feeling of fleece and loves all his clothes that feel like that. His favourite cardigan is fleece. I expect he was thinking about the summer when he picked these out. He loved the fact that the lion had glasses on and the funky trainers. 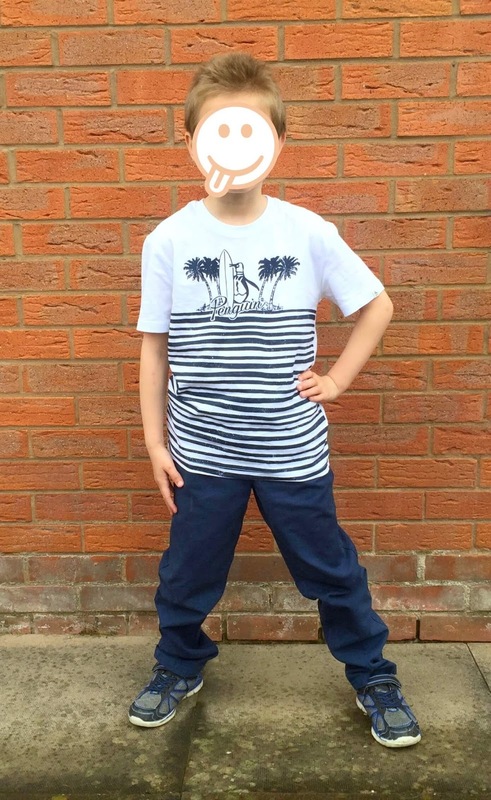 The Penguin Tee is in size 8-9 yrs and the Chinos are in size 7-8yrs, both perfect for LP. We visited the in-laws at the weekend and he couldn't wait to show his Nan his new clothes. The Penguin Tee is great quality, I've a feeling that's going to last for a long time. It fits great and, more importantly, he looks cool. The Chinos are good too, they have an elasticated waist so for someone like LP who has a tiny waist it can be adjusted. They're a little bit long but not too long to drag on the floor. He loves this outfit and insists that I wash the clothes straight away so he can wear them again. 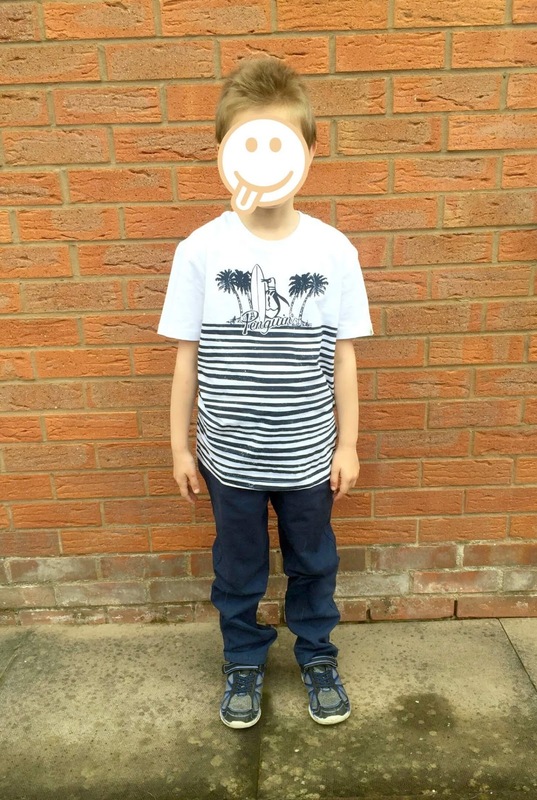 All outfits mentioned, apart from the Tesco trainers, can be found at House of Fraser in their Kids Collection. Check it out, they've got some great pieces. 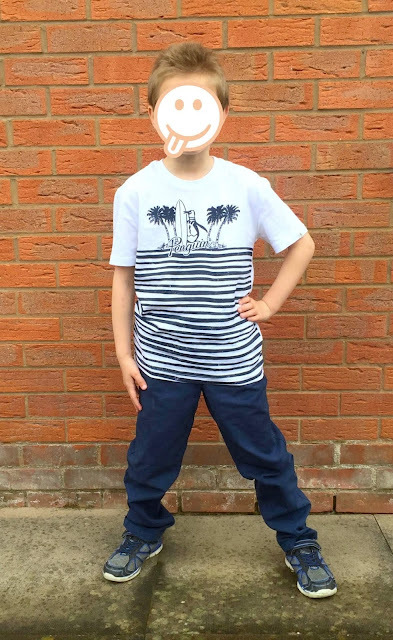 We were sent the Penguin Tee and Chinos free of charge in exchange for this post. All opinions are our own. I love those outfit choices.